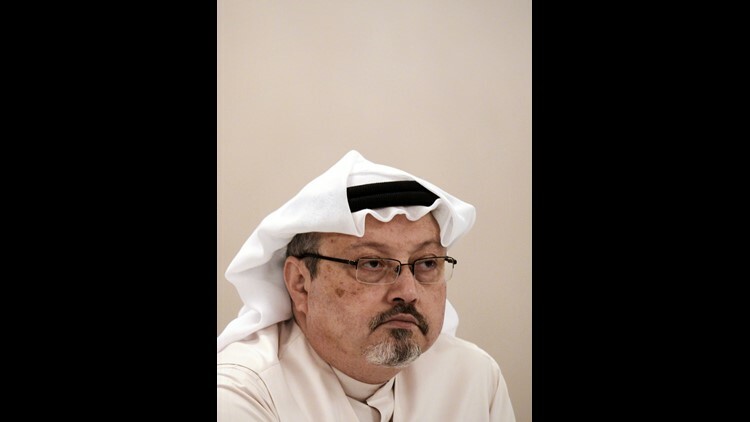 Saudi Arabian journalist Jamal Khashoggi, a critic of the government who lived in self-imposed exile in the United States, went missing Oct. 2 after entering the Saudi consulate in Istanbul to obtain paperwork he needed to marry his Turkish fiancée. He has not been seen since, leading to various theories about what happened to him. WHAT'S THE MAIN WORKING THEORY? Khashoggi may have been abducted or slain inside the consulate. A surveillance video shows him entering the consulate, but there are no images of him coming back out. His fiancée, Hatice Cengiz, who was waiting outside for him, says she has not heard anything from him since he went into the consulate Oct. 2. Two leading U.S. intelligence agencies, the CIA and the Director of National Intelligence, declined to comment through their spokesmen. Turkish media has published the names of 15 Saudi nationals who traveled to Istanbul the day Khashoggi disappeared. One of the individuals is the head of a forensic department in Saudi Arabia's intelligence services. Others appear to be Saudi agents of one kind or another, according to Turkey's Sabah newspaper. On Thursday, NBC News reported that Khashoggi checked his cellphone just before entering the Saudi consulate. But he never read messages sent to him minutes later. The detail would appear to corroborate the timeline of his disappearance. Saudi Arabia has dismissed all allegations it took part in any plot against Khashoggi. WHERE ARE WE WITH THE INVESTIGATION? Turkey has said it is preparing to search the Saudi consulate for any evidence of what may have happened to Khashoggi. However, no specific timeline for that has been made public. Turkey believes that Khashoggi was killed inside the compound. President Donald Trump said Thursday that the U.S. investigators are also launching a probe after a bipartisan group of senators demanded the White House do so. Turkish media have reported, citing government officials, that the 15-member team from Saudi Arabia that targeted Khashoggi included Saudi royal guards, intelligence officers, soldiers and an autopsy expert. The Chief Public Prosecutor’s Office in Istanbul has already opened a formal investigation into Khashoggi’s disappearance and Turkey's President Recep Tayyip Erdogan’s intensified pressure on the kingdom by telling reporters Thursday that "we cannot remain silent to such an incident." Unhappy with the Trump administration’s handling of the situation, Congress took its own action Wednesday – using a 2012 international sanctions law to force the White House to open an investigation into Khashoggi’s fate. On Wednesday, 20 senators wrote to Trump compelling the probe and noting that if the White House finds any foreign actor responsible, that could trigger sanctions against that individual or country. Trump told reporters Thursday his administration would investigate but rejected the idea of retaliating against the Saudis by canceling future arms sales. WHAT'S AT STAKE FOR U.S.-SAUDI RELATIONS? The fate of Khashoggi and what happened to him inside the consulate will test the U.S.-Saudi Arabian relationship, a partnership that has been revitalized under Trump. Not only did the president make Saudi Arabia his first overseas visit as president, Riyadh is also a key ally against Iran and cooperates with the U.S. on a variety of Washington's foreign policy goals in the Middle East – on oil, missile defense, terrorism and more. Rep. Adam Schiff, D-Calif., the ranking member of the House Intelligence Committee, said Wednesday, without elaborating: "If the horrific allegations of what occurred are accurate, this episode must dramatically recast the U.S.-Saudi relationship." Republican Sen. Lindsey Graham, a longtime champion of close relations with Saudi Arabia who has presided over various U.S. arm sales deals to the kingdom, put it in even starker terms. If the Saudis are deemed to be responsible, "there will be hell to pay," he said. "If they’re this brazen, it shows contempt, contempt for everything we stand for, contempt for the relationship. I don’t want to prejudge, but if it goes down the road that I’m worried about it going down, contempt will be met with contempt." In the interview with Fox News, Trump appeared to indicate that he would not consider blocking arms sales to Saudi Arabia. "I think that would be hurting us," he said. "We have jobs, we have a lot of things happening in this country. ... And frankly, I think that that would be a very, very tough pill to swallow for our country."